First of all sorry for the dusty mirror pics, but I left my camera at my parents house so I've been using my iphone! I decided instead of letting it hold me back I'd just try and come up with new ways of sharing my photos and try taking decent photos on my iphone. I'm liking it so far! This is the kind of thing I'm wearing every day at the moment. It's too cold to leave the house so I've been lounging in comfy leggings and sweaters, and my creepers have not left my feet in the last week. I clearly like leggings a lot. It might even be an addiction 'cos I've been buying them for years and have never got over this "phase". Much like the everything-I-wear-must-be-high-waisted phase my mam is still hoping I'll grow out of (sorry mam, don't see that happening for a while)! 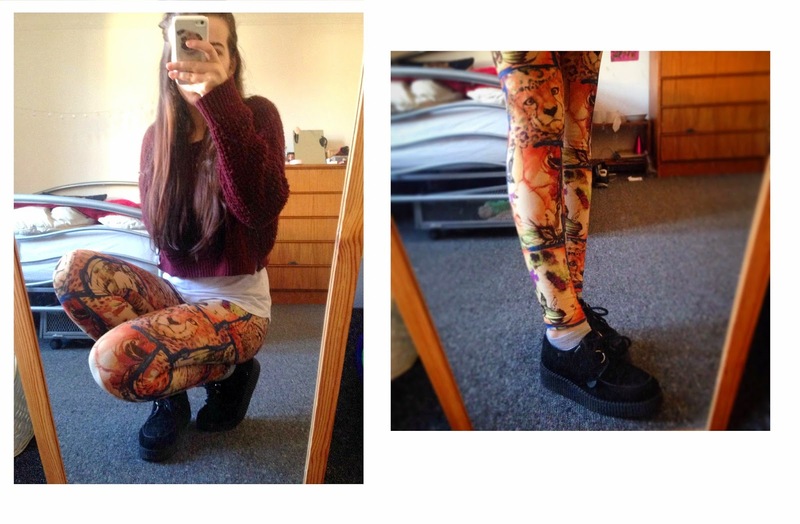 Two days ago a friend on my course said to me "do you actually own a pair of leggings that aren't loud and crazy?" which I do, I honestly do! I have one plain black pair. And a pair of black velvet ones which I consider tame but another friend told me they look like curtains. Not sure who even has velvet curtains but ok. I bought these leggings in the shopping centre in Southampton, I can't even remember the name of the shop but I'd know it and want to go back! Its kind of like Camden market crammed into one shop in the middle of Southampton ahah! I bought these and a pair of silver shiny leggings for about £7 each in a sale. I LOVE leggings, I've been wearing them at home a lot lately since I've been getting into yoga and they're perfect for lounging around in and doing a bit of yoga! I love this. I have that jumper! Those leggings are actually awesome, I really need to get some more patterned ones, I just find them quite hard to style! This really reminds me of the way I used to dress, loud leggings and jumpers. I don't wear them as much now really, only on days in really. :) I like those ones though. I now prefer just plain leggings or the "wet look" or "leather look" ones. They go with virtually anything. I also have a pair of velvet ones just so people know I alternate between leggings. I think the velvet ones are a little unique. Haha "loud and crazy" people are funny... Usually I'm asked things like "don't you dye your hair normal colours" and "do you always have to wear something with animals on?!" well the leggings do look fab on you, i wish I wore more patterns and fun prints!! Loving the bold pattern. you look great.